Q Grant Salvona poses an intriguing query: "Can please you tell me the last time Celtic and Rangers each started a game with 11 Scottish players?" Yes, I know that neither Stuart McCall nor Richard Gough were actually BORN in Scotland but with 101 international caps between them, I think they qualify. Q Robert Houston asks: "Who is the youngest Scottish player to win a full cap?" A This was John Lambie of Queens Park who was born on December 18th 1868 and made his debut against Ireland in Belfast on Mar 20th 1886 aged 17 years and 92 days. Not only was this his debut, he also captained the side and scored one of the goals in a 7-2 victory. Q Jim Wilson wants to know "Has any professional football player played for all four Fife clubs (Cowdenbeath, East Fife, Dunfermline and Raith Rovers)?" A There may well have been others but one who comes to mind is Gordon Forrest who played for all four Fife teams as well as Berwick, Alloa, East Stirling, Stenhousemuir and Falkirk in a career that lasted from 1972 to 1985. 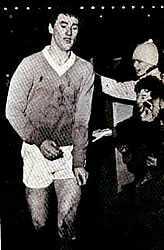 He made almost 40 appearances in the league with Dunfermline before moving on to Alloa in 1975. He joined Raith Rovers during the 1977-78 season and was there for two years, making over 40 league appearances, many as a substitute, then left for Cowdenbeath early in 1980. He was more regular there, turning out almost 100 times before joining Falkirk in December 1982. He didnt play that many games there before completing his Fife collection with East Fife in 1983-84. He made five appearances at the start of 1983-84 for them before moving on to Stenhousemuir where he ended his playing days. Q Craig Kerr is back with more on Ally McCoist. "I believe that McCoist is the only ever striker to win Golden Boots as top scorer in Europe back to back; a remarkable achievement considering that goals scored in Scotland count less than goals scored in La Liga, Premiership, Bundesliga etc. Am I misinformed (it wouldn't be the first time)?" The Golden Boot was awarded by 'France Football' from 1967-68 to 1989-90 on the simple basis that the winner was the player who had scored the most League goals in Europe that season. From 1990-91-1995-96 there was no award. Since 1996-97 the award has again been made but with weighting introduced so that goals from stronger leagues are awarded more points. Therefore McCoist never actually won a Golden Boot as such. However in both 1991-92 and 92-93 he was generally recognised as the top scorer in Europe. There were players in Georgia who scored more goals than McCoist in these seasons but that country was caught up in turmoil and mini-wars following the break-up of the Soviet Union and 'records' from that time are generally disregarded by football historians. McCoists unofficial awards come from BEFORE the introduction of weighting. If anything his achievements are slightly less impressive as they were in seasons when Scottish football played more League matches (44) than any other European country. Regarding winning in two successive seasons: in 1998-99 Mario Jardel won the Golden Boot while with Porto, scoring 36 goals at two points a goal. But he was also the top scorer in Europe regardless of weighting. The following season Jardel was again the top scorer in Europe, this time with 38 goals. However Portugals League was downgraded in the rankings to 1.5 points a goal so Jardels 57 points wasnt enough to win the Golden Boot which was awarded to Sunderlands Kevin Phillips who scored 30 goals at two points a goal for a total of 60 points. The international football statistics organisation the RSSSF has compiled a list of players who would have been golden boot winners prior to 1967. Several players were top scorers twice in succession and two did better than that. Josef Bican of Slavia Prague was top scorer for five years running from 1939-44 but should, in the opinion of many, (including here) be disregarded on account of the Second World War when many Leagues did not function. Youll see from the list that several Scottish players were also top scorers in Europe. Q From Graham McEwan: "How many times was the Drybrough Cup played for?" A The Drybrough Cup was played six times in all - 1971-72, 72-73, 73-74, 74-75, 79-80 and 80-81 and your query gives us a chance to outline the history of one of the Scottish game's more obscure tournaments. The early 1970s saw the authorities begin to move away from their long-standing opposition to sponsorship. But they embraced commercialism only tentatively, refusing to allow companies to lend their name to existing tournaments. 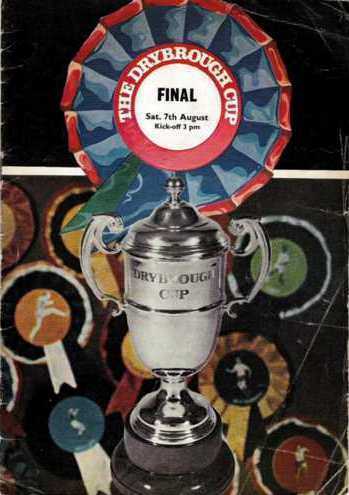 As a result those companies prepared to put some money into the game had to set up their own tournaments, of which the Drybrough Cup was one - the first sponsored competition exclusive to Scottish clubs. The competition was established in 1971, a year after the similar Watney Cup had been introduced in England and was open to the clubs which scored the most League goals in the preceding season - the top four from the then two existing divisions - with the draw seeded so that top division clubs couldn't clash in the opening round. It was played before the start of the traditional season and all competitions were done and dusted inside a week. There was none of the giant-killing associated with the Watney Cup (where Halifax knocked out the Man Utd of Best, Law and Charlton and the competition was won by Colchester!) as all four top league sides - Aberdeen, Airdrie, Celtic and St Johnstone won their ties on Saturday July 31st 1971 and the Dons and the Celts triumphed in midweek semi-finals to clash at Pittodrie in the Final on August 7th. This was an open, attractive match watched by around 25,000 which Aberdeen won 2-1 thanks to goals from a Joe Harper spot-kick and Davie Robb. John Hughes scored for Celtic. Although ostensibly for an equal number of first and second division sides, unsurprisingly the two promoted teams - Partick Thistle and East Fife - were among the lower division's leading scorers. So, in reality there were six 1st Division sides taking part. The two lower league sides - Dumbarton and Arbroath - went on to win promotion in 1971-72. The initial tournament was judged a success. Each entrant was guaranteed a minimum of £1,000 (a tidy sum for some clubs) out of the £25,000 pot the sponsors put up for grabs. Significantly though, even at this stage, Celtic were reluctant entrants. They felt it was a needless addition to the calendar and they had a point. In England the Watney Cup was played for by the highest scorers EXCLUDING teams who qualified for Europe or won promotion. In 72-73 the four lower sides were again eliminated immediately but the competition was still a success - a total of 67,000 watched the opening round. 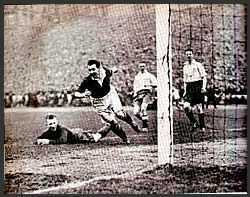 The Final was scheduled for Hampden - probably in anticipation of an Old Firm clash - but it was an all-green affair as Celtic bested Aberdeen 3-2 in front of 40,000 at Parkhead in the semis while Hibs crushed a full-strength Rangers (nine of the Cup-Winners Cup winning team plus Colin Jackson and Andy Penman) 3-0 before a crowd of 27,111. But the competition had powerful detractors. None more so than Jock Stein who made his view quite clear in the match programme for the Aberdeen game: "I am one of those who are not really enamoured of this kind of cup-tie football at this time of year." This could be construed as biting the hand that feeds you, except that Celtic, at that time, were well-enough fed as it was! The Final was a thrilling affair where Celtic came back from two down at the interval to take the game to extra time before Hibs triumphed 5-3. While the attendance of 49,462 was nowhere near filling Hampden, it wasn't a bad figure for the first week of August. At the start of 1973-74 the four top division sides - all playing at home - won once again, though Raith Rovers came close to an upset by taking Dundee to extra time. Attendances, other than at Dens Park, were pretty decent too. In the last four Celtic cruised past Dundee 4-0 with 26,000 inside Parkhead while at Easter Road, Hibs and Rangers again contested a Final spot. 28,089 saw the holders edge through 2-1 after extra time. For the second successive season the Final was a Hibs-Celtic affair. This time though it was a much poorer game as Hibs retained the trophy in front of 49,204 thanks to the only goal of the game from Alan Gordon in extra time. In 1974-75 it was as you were as the four top sides all won. And while there may have been a falling away in support from the Old Firm, interest was still strong elsewhere. This writer was one of the 13,272 in attendance at Easter Road to watch Hibs beat Killie 2-1 on the unfeasibly early date for a football game of July 27th. Once again the nearest thing to an upset was Dundee scraping through after extra time - this time against Queen of the South. Extra time was also required at Dens Park in the last four before Celtic won through to the Final while Rangers finally won at Easter Road, beating Hibs 3-2. The first Old Firm final attracted 57,558 to Hampden to see an exciting encounter which left the teams deadlocked 2-2 after 120 minutes. Celtic finally got their hands on the trophy winning the penalty shoot-out 4-2. After that the competition went into cold storage. Scottish football was restructured into three divisions at the end of the season, meaning two more League matches for the new Premier Division clubs. Coupled with the Old Firm's dislike it looked like the end. But the Drybrough Cup made a brief comeback at the end of the decade. In 1979-80 it still held enough allure to encourage over 10,000 along to Rugby Park to see Rangers beat Killie in the last four before going on to record their only success in the tourney, defeating Celtic 3-1 in the Final in a match most memorable for a Davie Cooper goal when he received the ball on his chest with his back to goal, swivelled and flicked it past four Celtic defenders before scoring. But this was a competition whose time had come and gone. Fittingly, the first winners were also the last as Aberdeen beat St Mirren 2-1 in the 1980-81 Final (the only one that the tourney's arch-opponents Celtic didn't feature in) at Hampden. But whereas the Dons first victory was celebrated, this triumph doesn't even merit a footnote as a recent history of the club states: "History shows 1980-81 to be a season in which the Dons had nothing to show in terms of silverware." When the winners don't even think the winning's worth mentioning it comes as little surprise to find the Drybrough Cup quietly interred some time shortly after August 2nd 1980 - the date of the last Final.